Buy (Order online) Kala chuvadu Monthly Magazine (Magasin) Now. Kalachuvadu Monthly Magazine prices are inclusive of shipping and handling through USPS. (for US deliveries). For other Countries shipping will be handled through their Postal Services (like Airmail in India). Address for delivery (Subscription) can be changed anytime. Please mail us the changed address details to info@magazinesemporium.com. Kalachuvadu Monthly Magazine பிப்ரவரி 2019 மாத இதழ்: This issue of Kalachuvadu flashes on this. There a four short stories by four writers who dwell in the various nooks of the globe. Pathinathan from India, A S Kandaraja from Australia , Elango DJ from Canada and Rashmi from United kingdom portray the life of Tamils in the lands of refuge. Sahitya Akademy winner for this year S Ramakrishnan contributes a story for this number. Poems are by Pa Ahilan from Sri Lanka. A study by Gunasekar on the classic text “KOKKOKAM which speaks the love lust and eroticism of Tamils is the highlighter of this issue. Perumal murugan reviews A R Venkatachalapathi’s book on Tamil Encyclopedia , and Riyaz on Ba Venkatesan’s new novel Varanasi. Stalin Rjangam revisits the memories of Budhism in Tamil milieu. Eminent film maker Mrinal Sen remembered for his outstanding contributions to the art of cinema by S Anand and P K Sreenivasan speaks about R K Alwar who run a pavement bookshop in Chennai in a poignant piece. Kalachuvadu is an international monthly journal for politics and culture. Published since 1988, it was founded by the noted Tamil writer Sundara Ramaswamy (1931-2005). The Magazine was published first as a quarterly then a bi-monthly and has been a monthly since 2004. Kala chuvadu maadha idhal Magazine subscriptions will commence either from current issue or from next coming issue. 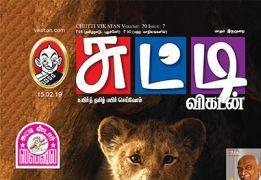 காலச்சுவடு Tamil Magazine will be shipped immediately on getting the issues from the publisher. They are inclusive of Diwali and Annual issues. Any special issues will also be sent free.